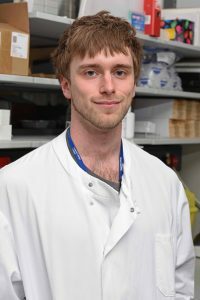 I completed my MBiolSci degree in Biochemistry and Microbiology at the University of Sheffield in 2013, including a one year placement in cancer cell targets biology at AstraZeneca. I was subsequently awarded an MRC/Asthma UK studentship, which funded an MSc in Immunology at King’s College London and a PhD entitled Airway Epithelial Cell and Macrophage Regulation of Pulmonary Immunity in the Lloyd group at Imperial College London. I received my PhD in early 2018 and am currently a postdoctoral researcher in the Lloyd group. My work centres on local cytokine regulation of airway macrophage phenotype and function, and on the balance between pro-inflammatory and immunoregulatory roles of airway macrophages during allergic airway disease and respiratory infection.